South-west Turkey is considered one of the most beautiful places on the Mediterranean, this is clear to see when destinations such as Butterfly Valley are described as paradise on earth. Every year cruises from large and small harbour towns on the Turkish coast show visitors the best places to visit. https://alaturkacruises.com is a company that specialises in small cruises along the south-west coastline, known as the Turquoise Coast, offering luxury travel in traditional gulets. Gulets are traditional wooden boats, commonly built around the Mediterranean and has been popular throughout history in Turkey. In the past, they would have been used for Fishing trawls. Sponge diving and short-range cargo vessels. Modern gulets are designed for comfort and luxury. Traditional captains have a strong connection to these boats and often aid if not lead the maintenance on them. This personal care adds a level of comfort that can only be found on small cruises. While these are small vessels the comfort is not cut, onboard you can find spacious sunbathing and seating, relaxing dining area and polished wood cabins. Many have lounge areas inside with TV’s here and on deck as well as music system to enjoy almost any kind of entertainment. The Turquoise Coast is not the only place these gulets can reach while touring, just off the coast in the heart of the Aegean is the Dodecanes island chain. This island chain is inhabited by Greek families and offers amazing views of stunning beaches. Most of these islands feature in myths and legends. The islands of Kos and Nisyros are a key part of Greek history. This island of Kos was where Poseidon fought the giant Polybotes during the war of the gods, as the giant was facing defeat he tried to flee from the god. To prevent his foe from escaping Poseidon broke a part of Kos away and threw it, pinning the giant beneath the landmass and water. Legend tells us that the giant is still trapped there and that earthquakes are caused by his heart beating. Legends aside, these two islands have beautiful beaches looking out over the turquoise waters where everyone can relax and swim in peace. The towns are built with traditional Greek style, with stark white buildings and coloured wood window and door frame beautifully contrast themselves with the natural greenery of the islands and blue waters that are so prominent. 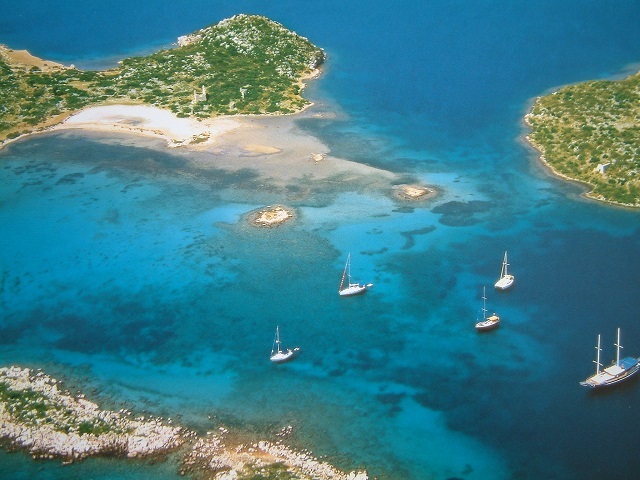 Myths and legends are not limited to the Greek islands, towns such as Bodrum are famous for their history also. The harbour town of Bodrum was once called Halicarnassus, here is where one of the seven wonders of the ancient world was built. Mausolus planned an extravagant mausoleum and began the build before he died, upon his death, his sister-wife Artemisia spared no expense in finishing the project. She messaged master builders from Greece including Scopas who supervised the rebuild of another wonder, Temple of Artemis. Today the Mausoleum has joined the other six wonders that have been destroyed over the generations, a few blocks have been taken and incorporated in other places. The ruins can still be visited, while not much is left the grandeur can be understood from what is left. 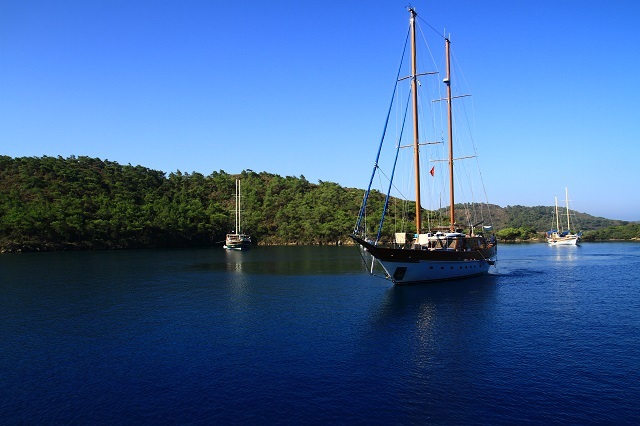 When visitors take a gulet cruise they are always pleasantly surprised that there is always something to do. As the cruises sail to each of the destinations there are fresh homemade foods that surprise with the flavours used in traditional Turkish cooking. Of course, there are plenty of extras available to be enjoyed, paragliding above the famous beach of Oludeniz or why not dive below the surface of the ocean at Kas. An ideal way to Begin and End each day is to sleep on deck, waking up to the sun rising over the waters has been said to be a good omen for a great day ahead. After a day activity, there is no better way to settle down to sleep than to gently rock on the ocean gazing at the unmasked stars.